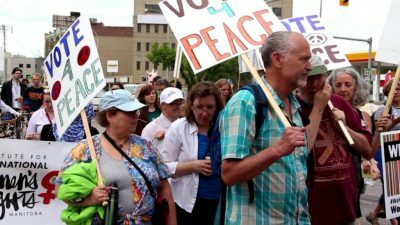 The theme of this year’s Winnipeg Walk for Peace is Solidarity of People Against War. We will meet on the west side of the Manitoba Legislative Building beginning at noon. The march will commence at 12:30. The world faces a refugee crisis. The scale is unprecedented. Currently, more than 65.3 million people have been forced from their homes by war and persecution. More than half come from three countries: Somalia, Afghanistan and Syria. While much of the focus has been on the impact asylum seekers are having on Europe, Europe hosts only 6 percent of the world’s refugees. Most find refuge in the Middle Eastern and African countries that, for the most part, lack the resources to shelter them. While Canada can and should do more to provide direct aid to refugees, we need to focus on root causes. Refugees would not exist without war. Through its booming arms trade and support for wars in Africa, Asia and the Middle East, Canada has helped create many more refugees than it has assisted. We need to withdraw our support for these conflicts and shut down our weapons industries. Moreover, we need to insist that our allies cease their interference in the affairs of other countries and work within the United Nations to end these conflicts. The key to overcoming the refugee crisis is to end war. Nothing else will do. We face many obstacles. A vast international military industrial complex depends on ceaseless war to guarantee its profitability. Politicians play upon the fears and suspicions of their constituents to foment support of militarism and hatred of refugees. This fear and hatred is amplified by mainstream and social media and fanned by religious extremists. To make matters worse, the United States and its allies have become increasingly provocative in their confrontations of Russia, China and North Korea. More than ever, we need to speak out for peace and disarmament. We need to show compassion for the victims of war and we need to end war. This is why the theme of this year’s Winnipeg Walk for Peace is Solidarity of People Against War. We hope you join us on June 17, 2017.